The MTSU Educational Talent Search (METS) program, in partnership with Women in Science and Engineering (WISE) invited fifteen METS participants from Cannon County High School and West Side School to the WISE Women Caring for Critters televised production at MTSU last Tuesday. 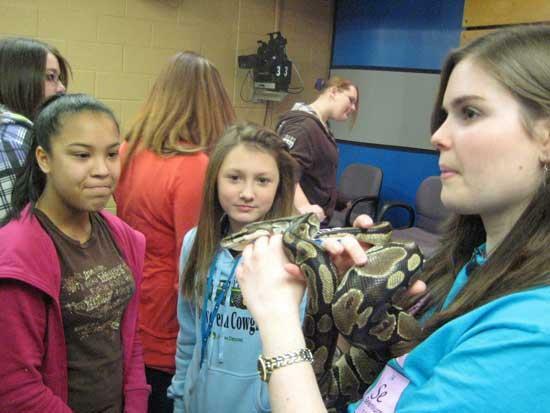 The girls learned about varied careers related to animals, Science, and Math and were able to chat with college students as well as interact with varied animals. The METS participants asked the college students great questions on varied topics related to college majors, internships, and careers. After the production, the Cannon County students received a behind-the-scenes tour of the television studio and the WISE dorm. They were then able to visit Dr. Judith Iriarte-Gross’ Chemistry class and finished the trip with lunch at MTSU’s University Center. One of the METS Seniors stated that she “can’t wait to get into the Animal Science class and do the hands on activities they talked about” when she goes to college. The trip was a great opportunity for the students because they were able to begin networking and learning about the varied opportunities available to them at a postsecondary institution. METS is a federally funded TRIO program that serves 6-12 grade students in Cannon, Coffee, Grundy, and Warren Counties and helps prepare participants for college. For information on METS, please contact Debbie Frisby at djfrisby@mtsu.edu or 931.205.7846. WISE women at MTSU are outstanding role models and leaders who support and encourage Tennessee girls in Science, Technology, Engineering, and Math (STEM) education. For more information on WISE or STEM careers, please contact Dr. Judith Iriarte-Gross at jiriarte@mtsu.edu or 615.904.8253.